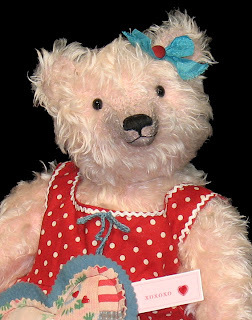 There is something utterly wonderful about a teddy bear (this little cutie is by Jody Battaglia). I love them, their expressions, their body language…and most of all, their simple capacity to imbue a scene with nostalgia. They are a yesterday, a soft memory in texture. 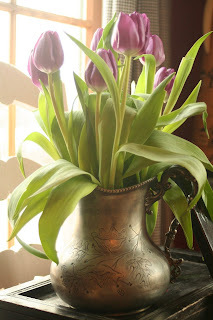 I have always had them about…in a favorite chair, in cupboards with other heirloom toys and folk art and, funny enough – popping out of countless pottery vases and vessels. When I broke the lid of a favorite teapot recently, I stuck a wee bear in it and voila -- the loss was a new display opportunity. 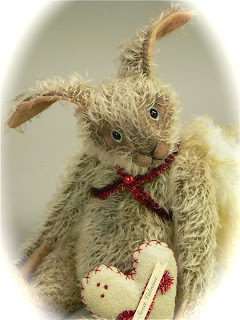 Teddies and chocolate have long been favored gifts for sweethearts on Valentines Day. Yes, I do have a sweetheart, and he is wonderful, but he is no giver of gifts. But never mind, I usually find a teddy for myself each Valentine's Day and “inform him gently” that his shopping has conveniently been done for him. Sascha from Pat Murphy …she is at the top of my wish list. 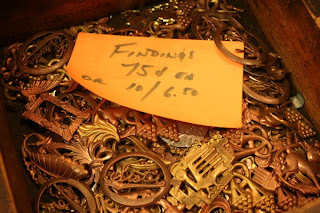 …then of course there is this little nugget by Lori Ann Corelis…. ...Now, with reference to chocolate, I’ll take mine straight up, dark please…and a bit a day does the trick...extra of course, in preparation for Valentine's Day! "the heART of winter" this weekend. 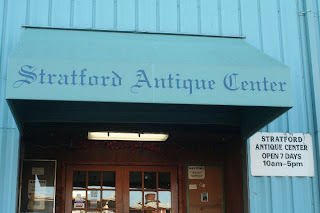 I gave myself the day off last Thursday and joined my folks on their monthly jaunt to the Stratford Antique Center…It never disappoints! 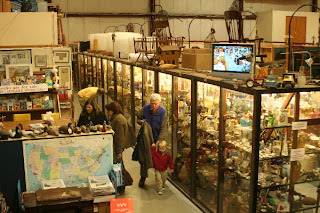 It’s one of the last, good multi-dealer antique fortresses and within an hour’s drive of Manhattan, Danbury and Springfield. I have been shopping there for 15 years (my Mom is one of their original dealers) and I still can nab some steals and deals...and splurges... whenever I visit. 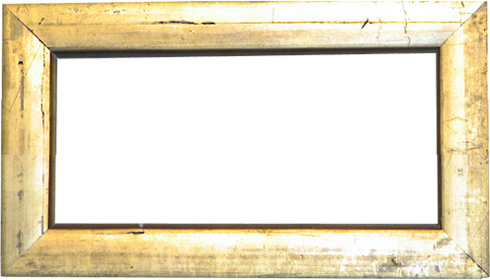 They have had no press, I think all in the know may have selfishly kept this place a secret….but it is time to share! Here's the locker area where you can stow your coat and purse to shop hands free...they always have a pot of fresh coffee to enjoy...and I like to grab one of their 6oz glass bottles of Coca-Cola from the old vending machine. 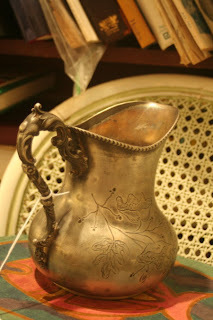 My first find of the day....a wonderfully curvy silver plated pitcher. It was a steal for $12.50 at the center! Here it is already in use in my dining room. Here's my splurge! 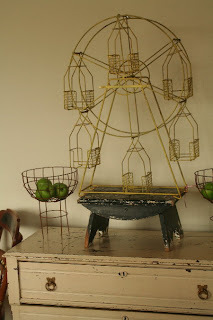 If you read this blog, you know I have always pined for old metal and folk art ferris wheels. 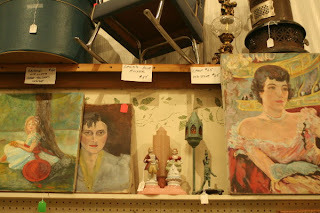 I found another antiquuing wiht Ro, Lisa and Stacey last summer. 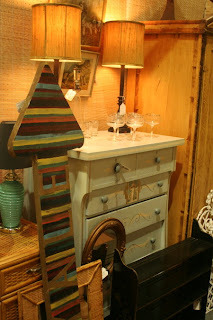 Here's my latest splurge ensconced in the den. 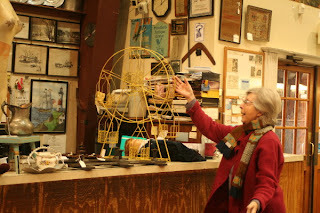 ...and here's dealer Betty Martin with the ferris wheel "in the rough" before it was mine! 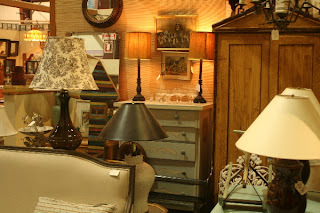 …16,500 square feet…big clean…well-lit and active! This huge facility was a warehouse and it sports 30 foot ceilings…look at these rows and rows of cool stuff…200+ dealers make this place well worth the trip! 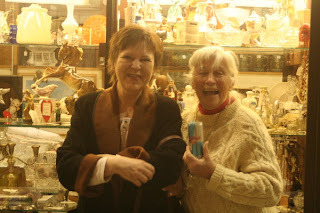 Here's my Mom and Sandy chatting about "Red Bull"...the elixir of life! 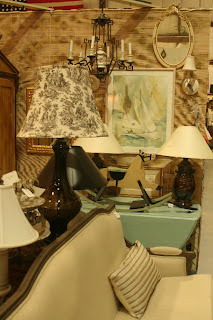 As Sandy was shopping, she heard my name and recognized me from this blog...too cool. Hi Sandy!!!! It was great meeting you and hope to see you at "heART of winter. Check out her blog! and her art! This booth packed color punch and had a ton of advertising signs. 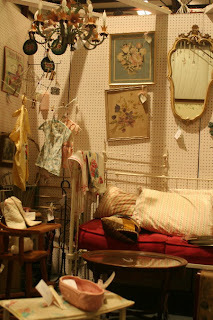 Lots of shabby chic finds in this booth. 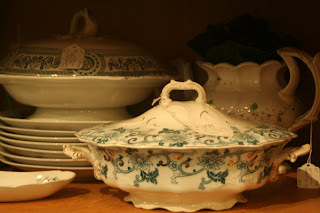 I loved this tureen. Such a shape... it must work out! 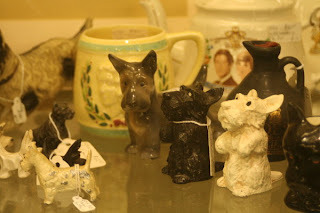 Piles of transferware tempted me. I nabbed two sugar bowls for $8 each! 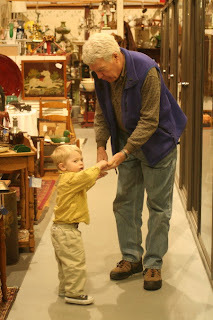 My Dad and his best little pal, Rory like to shop for old metal cowboys. This booth was loaded! I needed more time to explore! My niece loves these shell boxes. I love them stacked like this! A pair of Hitchcock chairs...what was I thinking!!! 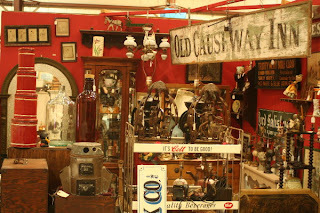 In this age of instant gratification and ebay haunting and hunting, I still prefer to shop for antiques in person….I love the summer’s shows, but in the winter months this place beats the blues for sure….I can get out and shop when it is 10 degrees at a large airy venue (and not one of those musky, low-ceiling malls!). 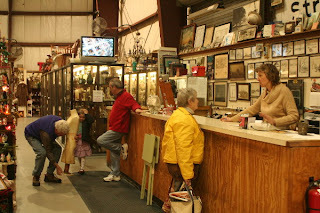 Hope you can add this Antique Adventure to your "TO DO" list. 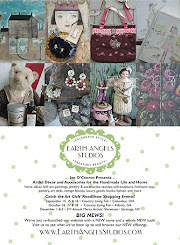 Just yesterday I received an e-mail from a potential collector of Jennifer Lanne's work...she asked, "How did you come up with "Earth Angels" for your business name?" And so I answered, "...artists, in using their talents to create, are magic to me ...like angels on Earth...". I looked at this piece called "The Earth Angel", created by my friend Debbee Thibualt, and began to reflect...I’ve been in business 12 years...and that business has evolved along the way. The journey has taken me from a small start dabbling with dolls and bears, and then soft sculpture, to a yellow brick road leading from Jody Battaglia to the world of folk art. 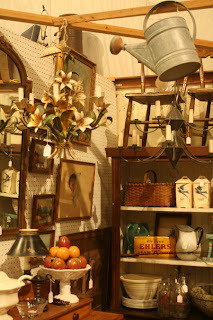 In that realm of paper mache, assemblage, mixed media and so many textures, I fell in love. Along the way I got pregnant with my first baby and left a career in urban planning. I had a fab job at the Brooklyn Chamber of Commerce, where I worked to help US manufactures and designers sell their products overseas,...sigh...but motherhood called. The website was launched by my pal Paul in 2000...there were just a handful of sites back then. The site, in its infancy, was a wee foothold in the cyber wilderness. Paul, my brave pioneer of a webmaster, grew it to it's present stature. Shows and travel were a huge part of my growth...getting out there...meeting artists, collectors, enthusiasts...seeing the reaction of customers to work in person. 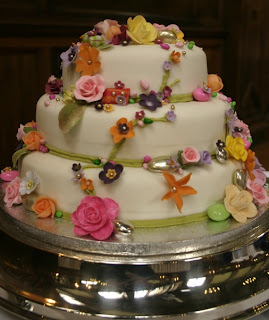 I started my Spring Soiree, the Fall Fete and the Valentine's Day Tea with the help of Jennifer Murphy and my sister-in-law Joanne (who now owns her own Tea Room)....I still wanted to see folks...and present the artists' creations in person where they could be held and touched. So many wonderful customer friends and collectors followed me and my events...their support and enthusiasm igniting my spirit! 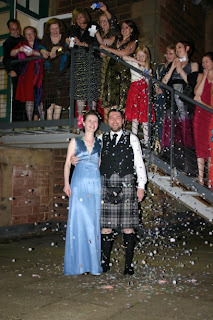 Ro and Harriet...do you remember that first little party with 16 guests under the apple trees? And the artists...through all of this, ever creating...ever inspiring! in the Gallery at The Country Life. We've had calls from folks coming in from NV, CA, MI, FL, DE, NH, PA, NJ, VT, MA, CT, AZ, and more who are coming in to see the show, meet the artists and be inspired by their creations....and a ton of calls from folks who have seen the event highlighted in the calendar of events in this month's "Country Living" magazine. I hope you can be a part of it too. This is a new adventure for all of us involved, and I am excited beyond words. It is my hope that we are all beginning a new and wonderful tradition together. 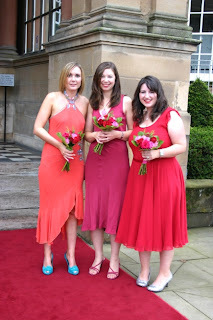 Weddings are wonderful...I love them...and I offer up joyful tears at each one I attend. 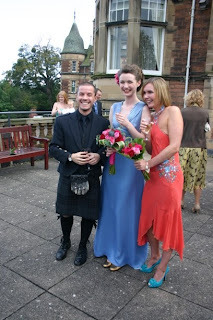 …Please join me in wishing Lynsey & Nicky every happiness and a lifetime together of bright, happy days. I think they are off to a fabulous start! 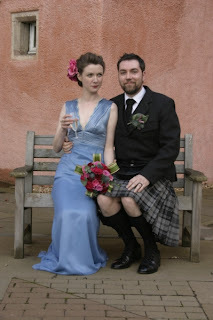 Here is Lynsey with Mal, he made her exquisite gown...and with them, Tammy...another talented textile artist you might recognize from HANDMADE at the NY Gift Show. Lynsey will be taking a break from the NY Gift Fair this January -- are you still on that honeymoon Lynsey?! 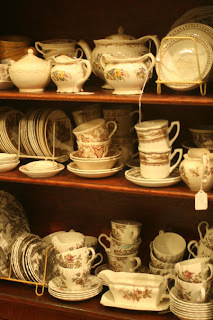 but, she has promised to come in August with a new collection...I am hoping to lure her to Warwick for a visit! I cannot wait to see you again Lynsey...we've been missing you! 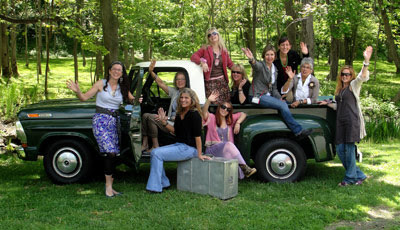 ...my fabulous friend is back in BLOGLAND... in full force! we have missed you and thanks for the fab new work. We cannot see what you bring to "the heART of winter"
But since I can't make it, the next best thing would be for you BLOG readers in Southern California, to attend and tell me all about it! 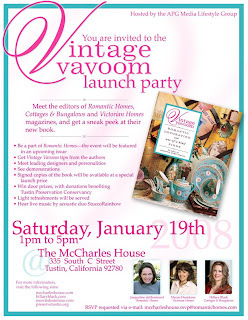 Please join Jacqueline deMontravel, Hillary Black and Merrie Destefano (the editors of Romantic Homes, Cottages & Bungalows and Victorian Homes) in festivities at The McCharles House as they unveil their new book...and share their ideas on adding vintage finds and flair to the home. While the event itself will be lovely, elegant, festive and tailored to please all who attend…the behind the scenes prep work is nothing glamorous…Denny and Robin were here for 4 days to whip me into shape and get the ball rolling! Jill came for a visit to cheer us on and lend a hand getting the space ready for the festivities. I need to give a big thanks to my pals Robin and Denny...they are two of my very favorite people on the planet. They are just plain fun, but beyond that, they are the most generous of spirits known...I wouldn't... and well, my business wouldn't...be here today without them. And, my addiction to dark chocolate would be sorely neglected without Robin's regular care packages! If you can attend "the heART of winter", watch for the dynamic duo of Denny and Robin...along with staff and gal pals Sue, Michelle, Ro, Nancy, Shannon and Cindy….they are the folks that make the magic possible! I love winter for its snow. Even though I grew up in the City, my Dad had me on skis at age 5. I have the fondest memories of skiing with my cousins at Windham, Belleayre, Hunter, Vernon Valley, Sugar Bush, Masthope, Smuggler's Notch (where I first experienced the pain of 10 below ), Stowe, Tanglewood, Fahnstock, and more places that no longer exist. ...I remember my cousins Paulie and Patrick as the jumpers, Uncle Paul the technical stylist, my Dad the king of the "stem christie", cousin Jessica the mogul mouse, Brother-in-law Pete the fearless instructor, and my sister Roseanna dragging poles like outriggers in her wake. Since Micah started young too, we are continuing the tradition and have made it our winter plan to ski every Saturday morning. It’s great to get out as a family for a prowl about in the snow and I have to confess to using muscles I forgot I had! I am back on my skis after a 7 year hiatus. I love it as much as ever. Called “The Friendly One”, Mount Peter in Warwick is the oldest operating ski area in New York State. First opened in 1936 by Macy*s department store as a showcase for its winter and ski fashions, it remains a wonderful recreational facility for families in the area. Hoping some of you will make a weekend of your visit to “the heART of winter”… and if you ski or snowboard, bring your gear! Mount Peter is just 2 miles form Downtown Warwick. Charlotte and I really like the cute gear best! Have you seen this issue yet? On page 74 you'll see the February "Calendar of Events".... and voila!.... a mention of our upcoming folk art show "the heART of winter" and a reminder to "mark your calendar" for February 2nd & 3rd. Thanks to Country Living for the mention of our event. 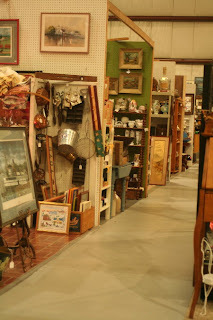 We sure hope you'll be able to visit Warwick, NY to join the fun...meet our artists... be inspired by original creations...and just maybe find something special for yourself or your home. Visit the events page on our website for full details on the show, more info on participating artists, and breakout events with Stacey Bear, Debbee Thibault and Nicol Sayre. and see Senior Editor Frances Bailey's recent articles on their site too!